The Smith and Wesson Extraction & Evasion Knife & Survival Kit has a 5.9 inch 1070 high carbon steel blade. 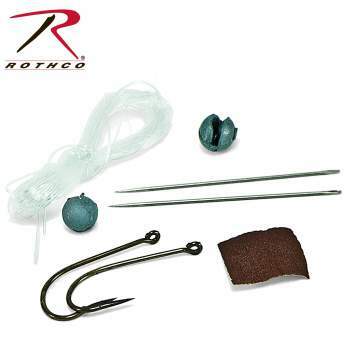 The nylon resin overlay handle includes knife sheath, fire striker, compass, key chain compass with a whistle, fishing line, fishing hooks, and sewing needles. The sheath can be attached to belt & also has MOLLE attachments. It also includes a smaller removable pouch for the fire striker and sharpening stone. The Smith and Wesson Extraction & Evasion Knife & Survival Kit has a 5.9 inch 1070 high carbon steel blade. 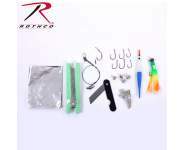 The nylon resin overlay handle includes: knife sheath, fire striker, compass, keychain compass with whistle, fishing line, fishing hooks, and sewing needles. The sheath can be attached to belt & also has MOLLE attachments. It also includes a smaller removable pouch for the fire striker and sharpening stone. WARNING: This product contains a chemical known to the State of California to cause cancer, birth defects and other reproductive harm.